72 hours or more notice...	We will refund 90% of the total Booking. Less than 24 hours notice... We will refund the total Booking less the full cost of the first night&#39;s stay including any meals and/or Third Party Services. 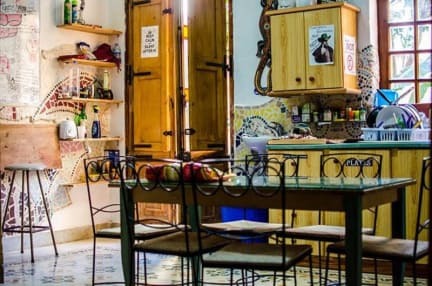 The hostel is a converted traditional Maltese townhouse, with large spacious rooms and lots of natural light. The community inside the hostel is amazing, hosts that will gladly help you with your travel needs. 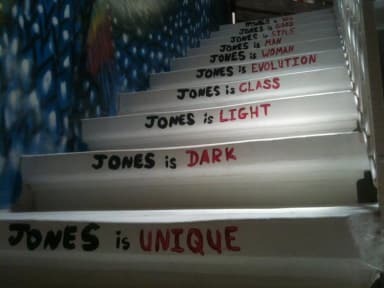 Hostel Jones is brand new, owned and run by two easy going , fun loving Maltese guys! If you are looking for something special... You've come to the right place. The concept of the hostel is revolutionary. Around 95% of the Hostel is made out of reused, repurposed or recycled materials. Talented local artists have designed each room. Art is everywhere within the hostel, the beauty it inspires grows the great atmosphere within this community. Hostel Jones has 6 Bedrooms with 29 beds. Rooms range from private rooms to dorms. If we were to tell you that you were going to stay in the coolest house, on the nicest street right in the middle of the most central town just 2 minutes away from a sweet beach would you come? You are on your way to making your Malta Hostel experience great. Check out from 05:00 to 11:00 . Such a nice artistic place! The artwork around the hostel and dormitories was stunning! And i especially loved the one in my room. The place makes you feel like home and i especially liked the fact that unlike the other Hostels I've stayed in i had a key from the dormitory too (entrance door key and a spacious locker key for my belongings). The stuff was super helpful and amazing in every way. Highly recommend! Beautifully decorated. Nice chill areas close to a shop for cheap beers. Really cool staff and a great vibe. I met some great new friends and had a blast. Jurrrrrrrgen! Very good hostel, close to everything and super friendly staff. Unfortunately I wasn’t able to stay here due to health concerns but the Hostel was super understanding and nice and didn’t charge me for my booking. They responded to my emails within hours and couldn’t have better customer service! I would not stay here again, never stayed in a hostel that does not have fans in the room(and I've stayed in a LOT of hostels) that's just tight, it's SO HOT at night, there is air con which you have to pay for, like 1or 2 euros for a few hours but then you have to agree with your room mates and make sure everyone is on board with keeping the doors and windows closed, we theAC in our room and it SUCKED, not enough bathrooms, hostel itself is really beautiful, but really need fans. Facilities seem a bit dirty and it gets really hot during the night. The staff is not very welcoming and there is no atmosphere at all. Good decoration and close to bus stops and small convenience stores. Good if you're staying for a few nights, but I wouldn't stay there another time. Was supposed to stay here for a week but left after one night - my dorm was incredibly dirty, beyond the realms of what is acceptably 'rustic'. Bunks are creaky and very small - I'm 5ft 8" / 172cm and the bed was barely long enough for me. Rooms boiling hot with no fan or AC. No individual lights for each bed (or charging points) so harsh strip lighting gets turned on every time a dorm mate comes home during the night. No security to stop people wandering in to dorm rooms on ground floor. I truly can't understand how this hostel has such high ratings. I arrived at 5pm to check in to be told I couldn't be checked in until the manager arrived at 6. This then changed to 6.30, then in an hour or so. This was all said by other guests who appeared to be long termers. I left and came back at 7pm where I was finally checked in by a rude guy. The place was cluttered, my locker didn't work, the bathrooms were dirty and had ants and there was hair all over the bedroom floor. Total rip off. Usually I don’t leave negative reviews however this is by far the worst hostel I’ve ever stayed at. The reception staff were rude and unhelpful, there was no atmosphere in the hostel, beds that sounded like they would break everytime someone moved, filthy bathrooms and a kitchen that smelt like something had been rotting for weeks. I would not recommend this hostel to anyone. One positive is it’s proximity to the water however with Malta being an island most hostels are only a few minutes walk.